This is very much my own formula adaptation, but it takes its inspiration from Daniel Leader’s lovely book “Local Breads: Sourdough and Whole-grain Recipes from Europe’s Best Artisan Bakers”, see pp. 158 – 161. Leader credits Armandio Pimenta, who has a bakery in Clermont-Ferrand, Auvergne, as the source for his formula. My effort does not use the same refreshment regime, nor does it rely on hot water at the mixing stage. Leader has a photograph of his loaf in the plates between pages 84 and 85 of my edition; the loaves I baked compare well, although I made 2 Miche, scaled at just over 1700g, where Leader’s recipe produces 1 loaf, slightly smaller at 1195g. Mix the sourdough, water and flours using a hook attachment, for 4 minutes on first speed, scraping down the bowl as needed. Autolyse for half an hour. Add the salt and mix 1 minute on first speed and 5 minutes on second speed, scraping down the bowl as required. DDT 26°C. Bulk ferment for 2½ hours. Scale the paste using wet hands into 2 pieces and shape round. Rest 15 minutes and prepare 2 bannetons dusted generously with dark rye flour. Re-shape the dough pieces and place smooth-side up into the bannetons. For baking, pre-heat the oven to 280°C for one hour. Tip the loaf directly onto the hearth stone, apply steam and bake without the fan for 15 minutes at 250°C. Drop the heat to 200°C, switch to convection and bake out for 50 minutes. We enjoyed one of these loaves with our dinner with friends last night. The depth of flavour from the sourdough was intense; it was an accompaniment to avocado, served with the biggest prawns I have ever seen. Munching on more of this bread with a salad for lunch today and I noted the sour flavour was much less pronounced, allowing more subtle flavours to come through; much improved to my taste. The crumb is moist, but not overly so, and wonderfully easy to chew on. The first loaf stood up tall in the oven, even though the formula uses over 72% rye flour. I used Organic white bread flour at 11.6% protein, not High Gluten flour. I should have delayed shaping the second loaf, as the long bake time meant this loaf was over-proved when it came to bake. I’ve photographed the best-looking loaf, although the crumb shots come from the over-proved one. We love this bread; such an eating treat for us for the rest of the week. The Market beckons; this means I have plenty of baking to do this week. Great looking bake as always! Your crumb looks nice an moist and open. Yes, this bread is very easy to eat! a beautiful loaf! I was in Auvergne 2 years ago and made photos of their different rye breads. But I wasn't in Thiézac and couldn't try their famous bread. Yours looks more like a Thièzac loaf (the round form, the rustic aspect), thought a Thièzas has 100% of rye flour. The region of Auvergne apparently produces wheat and rye. You may well be right that Seigle d'Auvergne should be made from all rye flour. Personally, I shy away from making 100% rye loaves in bannetons; I like to do these loaves in pans/tins, as you will most likely already be aware of. A remarkable looking loaf Andy. The close up of the crust is spectacular. Lots of color in that flour you are using. Thank you so much for your comments Eric, good to hear from you. As you know I am very attached to the Bacheldre Dark Rye which I use exclusively in the sourdough. I also used this plus some Gilchesters' Semolina as dust for the bannetons. I've had a fair bit of consultancy and teaching work on. It was a joy to just make the one type of bread. When this happens it is not worth firing up the wood-fired oven, of course! A magnificent and proud loaf of bread ... no pretensions. Will give you plenty of energy for all your baking during the week. Very handsome rye loaf! I've never tried this one, but I'd love to have a taste. As Phil said, this'll keep you going for the remainder of the week! I must get back to rye bread baking! Yours are truly inspiring! I've baked all of the rye breads in the Czech and Polish sections of Local Breads. I should look again at the French pains de siegles. The one you baked certainly is tempting. 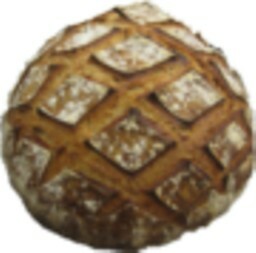 French peasant-style bread made with this level of rye? Yes you should bake this loaf! Eliabel suggests this should be made all-rye, as per Shiao-Pimg's post. I prefer the small amount of wheat, in all honesty. Looking forward to your post on this already! Your bread is every bit as beautiful as Mr. Leader's, and the crust is just like he describes! I like how Mr. Leader relates the bread's appearance to the region it comes from. I love the big closeup's of this beautiful bake! Your the rye man! The appearance somehow reminds me of the Auvergne landscape. Such a rustic earthy looking light rye, Andy! Nice work. believe that light rye was like Pierre Nury's Rustic Light Rye where there is almost no rye in the bread :-) Rye is in the eye of the beholder! Light Rye is 0.997% ash, Dark is anywhere between 1.35 and 1.8%. Apparently an authentic loaf of this kind is made with all rye flour! I'm only brave enough to make such loaves in pans. I was thinking maybe it could use some, maybe a small amount 25 g or so, of the fake red rye malt. What do you think? You and so many other bakers on TFL are inspirational. I haven't even heard of 10% the breads you folks are baking. Thanks for sharing your recipes. I'm sceptical that incorporating Red Rye here will give you what you want. This is a French traditional recipe, although the real thing is made with 100% rye flours, apparently! The Red Rye is usually used in conjunction with use of a hot "scald" in Russian bread baking. Red Rye is best used in formulae for Borodinsky and Rossisky in the Russian tradition. I look forward to reading your post, whatever you decide to make. version of this bread and it turned out great - even though it appears that my version of red rye malt isn't - at all. Just loved this bread with the scald anyway. Posted it as Seigle d’Auvergne Meets Borodinski. Thanks for the recipe again. I made it this weekend and was going to put it in the freezer for Easter. nearly half gone already! I have a French cousin coming...but really don't have the energy to do it again so will have to slice it before they arrive. thanks a lot, it is on the favorites list forever. Sorry for the delay in getting back to you; I had a few weeks away from the Board to finish my studies. Do you have an oven thermometer to use to monitor the real temperature inside your oven? Ordinarily, I find the exact opposite effect with switching to Convection. I tend to compensate by lowering the temperature by 15*C to stop bread from becoming too dark. Do note, however, that these are very big loaves....over 1700g. They are also dense-textured, so a lengthy and solid bake is essential. They have to be in the oven a minimum of 1 hour. After that, you can use a probe to ensure the core temperature has reached 96*C. These 2 measures would be my initial baking parameters. I don't think you will get away with a single proof in the banneton I'm afraid. You could give it a try, but there is a danger that the bread will be overly dense. However, the principles espoused by Leader ensure relatively rapid fermentation, as the process uses hot water. Do you have a copy of Local Breads by Daniel Leader? The temperatures I cite are the real temperatures for my SMEG electric oven. However, I usually bake wood-fired, in my brick oven, so the baking temperatures can be much more variable! Many thanks for you compliments; I am really glad to read how much you like this bread. I'll send you a pm later with more advice. If you have the book it will make sense to you. I realise in this post I didn't use the hot water process, but I do now. It will speed up your bulk time, I'm sure. Yes, the book is legendary for its errors, I'm afraid. When you log into TFL, you should see "Messages" in the top left of the options. Click on that and there should be a message from me.